Article with head line HTC One Max user manual and quick start guide in here aims to help HTC One Max users to be able to use HTC One Max user manual better. Because we think with HTC One Max user manual you can learn your HTC One max with more easy and better. This article also has HTC One Max review (video) and HTC Apps, So you can use HTC One Max more fun and more easy. After HTC succes release HTC one and now HTC company come again with new product HTC one Max. This product came with Qualcomm Snapdragon 600 processor 1.7GHz QUad-Core CPUs on 2GB of RAM, we think this is enough to your activity (game or work). In addition, HTC One Max has features that we think is rare in smartphones. The HTC One Max removes hassle to unlock users phones with a rear-side fingerprint scanner that unlocks the phone as well as launches your favourite apps with a single finger swipe. Up to three fingers can be registered. Forget complicated passwords, with the HTC One Max, you're just use a finger swipe. Coupled with HTC BoomSound, making HTC One Max have the volume blasting towards you, which makes a lover of movies, videos and music more and enjoy life. the decibel that you deserve from a double frontal stereo speakers reinforced with a built-in amp. High resolution (1080 x 1920 pixels). HDMI connector for TV-out (via micro USB). OS : Android with HTC Sense HTC BlinkFeed. CPU : Qualcomm Snapdragon 600 processor 1.7GHz quad-core CPUs. Battery : Capacity 3300 mAh. HTC One Mac 8060HD theme. See HTC One Max specs more clearly (HTC One Max). See HTC One Max features more clearly (HTC One Max). See HTC One Max apps more clearly (HTC One Max). 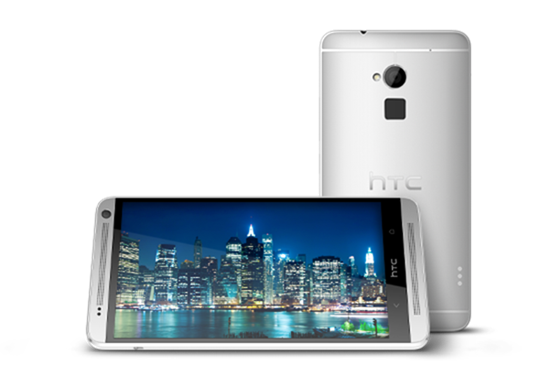 Learn more HTC One Max with download HTC One Max user manual in below and we sure you can use HTC One Max better. you also can download HTC apps to more fun with HTC One Max. download HTC One Max user manual English (download). HTC Skin GOWeather app free download. HTC Transfer Tools app free download. HTC Sense Go Launcher app free download. HTC Backup for HTC One app free download. HTC One Ringtone app free download. HTC Specialist app free download. HTC One lock screen app free download. HTC SmartSync Toggle app free download. HTC Sense 5 clock app free download. You can get more app for HTC in here. Hopefully useful to user HTC One Max. If you like this article or find problem, you can comment below.